If you're like most cat owners, then your precious cat had you at "meow." 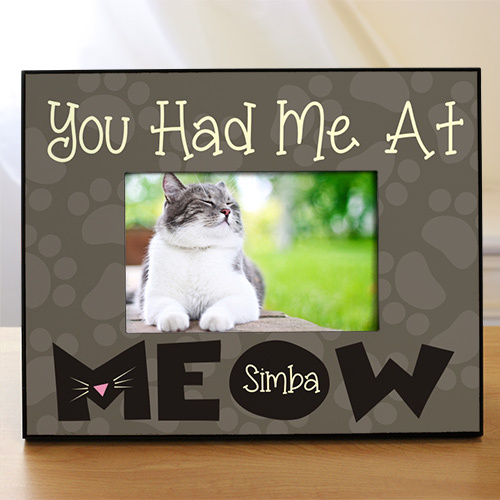 Show off your love for your adorable pussycat when you display your favorite photo of them in this sleek personalized pet frame. We guarantee that your family and friends will love the decoration in your home! Free personalization of any name is included. Very nice frame. Great quality and looks really nice too. Although I did not see the frame myself, my friend called me immediately to thank me for the beautiful frame for her cat Boots that just died. She said the whole family loved the frame and just could not get over how darling it was. She was very emotional about receiving such a thoughtful gift. It was such a hit, that I would consider buying again.